A major focus is refining the IP workflow moving audio, video from venues to IBC and beyond. With the FIFA Confederations Cup in the rearview mirror, the Fox Sports production team at the center of World Cup operations has turned its focus to the next phase of planning: applying the lessons learned during the Confederations Cup to preparing for next year’s main event. “Putting on 16 clean matches was goal No. 1,” notes Kevin Callahan, VP, field operations and engineering, Fox Sports, “but we very much used it as a test.” Fox Sports fielded a team of 75 people in Russia for the effort. The test covered everything from the broadcast systems that Fox Sports expects to use at the 12 stadiums next year to the use of IP connectivity between the venues and the IBC and even to security and logistics. The focus has been on the venue side of operations and refining a workflow that involves the use of IP to move audio and video signals from the commentary and pitch-side positions to two racks of equipment in the compound. The goal is to use flight cases in the cabin at each of the 12 World Cup venues and to connect them to smaller flight cases on the booth and on the field and to have all audio and video signals pass through to the IBC via the Lawo A_Line mic 8 audio-to-IP interface and Studio Technologies Dante-supported Model 380 and 374 beltpacks. The Confederations Cup comprised 16 matches played by eight teams. Fox had a core three-person announce team in Russia to call 10 matches onsite; for the other six matches, play-by-play was called from the stadium, with commentary and analysis by two analysts off-tube in Los Angeles. The technical team at the venue included an engineer, tech manager, and two A2s. It is expected that at least 50 matches will be called onsite next year. At the Confederations Cup. Fox Sports used a 10-Gbps data pipe to send content to Amazon Web Services in Frankfurt, Germany. Reach Engine served as a content-management system for the AWS storage with CMSI’s Beagle Networks on hand to oversee the IP network. One of the technical highlights for Fox Sports is a custom Lawo audio application that makes control of the in-ear mix for talent easier than ever. Fox also had a chance to test out a new version of the FIFA MAX server, which stores highlights and other video clips. The system has an interface that would be familiar to YouTube users, but it also allows the user to download not only the video and audio but transcriptions, translations, and even the subtitle files. One thing that was not able to be tested was taking in a 1080p host-broadcast feed and passing it through the Fox facilities. Next year, Fox will take a 1080p/50 signal into the IBC in Moscow and convert it to a 720p/60 signal. The next couple of months will be critical: Fox Sports needs to figure out its IBC space needs by Sept. 15. All studio content next year will be broadcast out of a studio in Red Square, and there will also be a smaller studio in the IBC, which will be located outside Moscow. Although the goal of the Confederations Cup was to get ready for next year’s World Cup, Callahan says the workflow in use this past month lays the groundwork for other productions as well. “We took this project as something that is not only about next year but also about home-run productions in the States,” says Callahan. 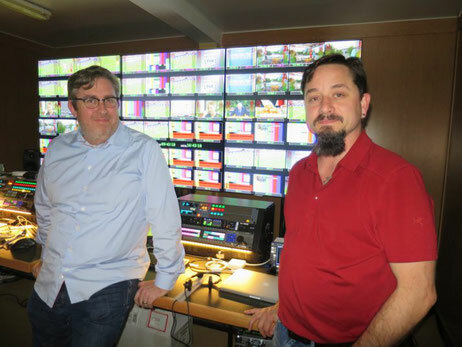 If the connectivity between the venue and broadcast center is good enough, the kits have the potential to streamline onsite studio operations by removing the need for a truck to be rolled in.